When a nuclear bomb goes off, the destruction is as horrifying as it is extensive. Buildings crumble, almost anything combustible ignites, and scores of people die - some instantly, yet many more through burns or radiation sickness. Not everything is ruined, however. In fact, there's a good chance survivors of nuclear war could dig through the post-apocalyptic rubble, grab a beer or soda, and quench their thirst without (too much) concern, as we first learned in an NPR blog post by Robert Krulwich. From 1945 through the late 1960s, the US government carried out several above-ground nuclear bomb tests in the Nevada desert. 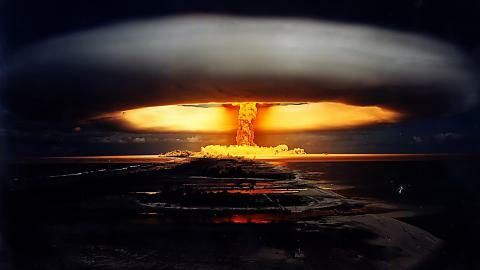 One series in 1955, called Operation Teapot, detonated 14 nuclear bombs to test new nuclear weapon designs and effects. As part of that work, researchers set out a bunch of cans and bottles of sodas and beers to see how they'd fare. The experiment resulted in a 1957 study titled, "The effect of nuclear explosions on commercially packaged beverages". "The closest containers were placed 'less than a quarter mile away,' says Alex [Wellerstein, a science historian], 'a mere 1,056 feet (322 metres)', the outliers a couple of miles off. Some were buried, some left in batches, others were placed side by side." Although beers closest to the blasts were slightly radioactive, researchers determined they were still drinkable - at least during an emergency. Drinks located further away were less irradiated. Scientists even taste-tested the beverages, most of which they deemed good (except those nearest the blast). Of course, searching for a refreshing beer or soda should not be your first priority if a bomb goes off in your city. A nuclear blast generates a lot of radioactive ash and dust, called fallout, when it goes off - and this is in part what researchers wanted to study the effects of. The illustration from FEMA (above) shows how nuclear blasts of various sizes generate different amounts of fallout. Some fallout comes from the bomb material itself, but soil, sand, rocks, wood, and other debris that get sucked into an explosion also get incinerated and irradiated into fallout. This material then carries with the wind away from ground zero, sprinkling it over a large area. So if you survive a nuclear blast, it's imperative that you find a thick, sturdy shelter - and quickly - to avoid the immediate dangers of radioactive fallout. You want to put as much between you and that ash and dust as possible. And if you're betting on an unfortunate turn of events in the near future, make sure to stock your prepper bunker with these long-lasting foods and beverages. » What's the actual difference between a hydrogen bomb and an atomic bomb?